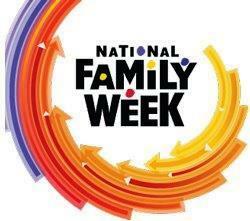 National Family Week is an annual celebration observed during the week of Thanksgiving and is designed to encourage families to spend quality time together. It’s an opportunity to plan a variety of activities that encourage family outings and togetherness. Research suggests it is critical to spend quality time together as a family, especially at the dinner table. Annually, statistics show children who eat dinner with their family are less likely to smoke, drink, or use drugs than their counterparts. (Cook and Dunifon) However, what happened to the family dinner hour, when people sat down together and talked? It seems that fast food, busy lifestyles and the necessity of having two income earners have made the family mealtime a thing of the past. Some people argue that the idea of a sit-down family meal just doesn’t work in today’s fast-paced society. Others point to the vanishing mealtime as just another symptom of our deteriorating family structure. And still others apathetically shrug their shoulders and say, “it’s a sign of the times and there’s nothing we can do about it”. Regardless of your position on the importance of family mealtime, clearly something needs to be done to revive it. During National Family Week, I challenge you to make mealtime with your family priority one. Here are some “family-friendly” suggestions to engage family members in mealtime conversations designed to strengthen the family unit. Sunday: Share your family history; learn about your family’s heritage. Tuesday: Tell a funny story about a special family member. Wednesday: Write a hand-written letter to a family member who is unable to be with you during the holiday season. Thursday: Thanksgiving Day – share things for which you are thankful. Friday: Focus on your favorite family traditions. Saturday – Share a TV-free and technology-free family activity. Making mealtime a priority can be difficult, but not impossible. It’s more than just a meal – it’s an opportunity for families to come together regularly in support of family unity. Start now and begin reaping the benefits of family mealtime togetherness. Musick, K. & Meier, A. (Forthcoming). Assessing Causality and persistence in associations between family dinners and adolescent well-being. Journal of Marriage and Family. Bennett, S. & Bennett R. (1994). Table Talk 365 ways to reclaim the family dinner hour. Bob Adams, Inc., Holbrook, MA.